Summer weather has finally arrived - with a vengeance! An intense high pressure system over Arizona is not only bringing us the hottest weather so far this summer it's also pumping up monsoonal moisture out of Mexico; that spells "muggy" in any language. East county temperatures are expected to top out today in the low 90s during the afternoon but with the humidity it will feel more like 100 and things only get hotter by Friday. That's when the heat wave hits its peak and by then we could be seeing highs of around 93 to 95 in the warmest valleys but again, the mugginess will make it seem a lot worse. By comparison coastal temperatures will be downright "cool" as highs are expected to range from about 75-80 the next few days. Still, with the exception of some light fog in the early morning hours, skies will be sunny and San Diego beaches will definitely be the place to go to escape the east county heat. Of course, if heat and humidity are "your thing" then don't stop at 90 in the valleys head for the deserts where today's high will be at 110-plus and by Friday, it should top out between 116-118. Throw in the humidity and you're in dangerous territory with it feeling like it's actually about 120 or so. There's also the chance that that monsoonal moisture might kick up some showers or isolated thunderstorms the next few afternoons. If that happens we could be looking at everything from lightning strikes causing wildfires to flashfloods caused by localized downpours. 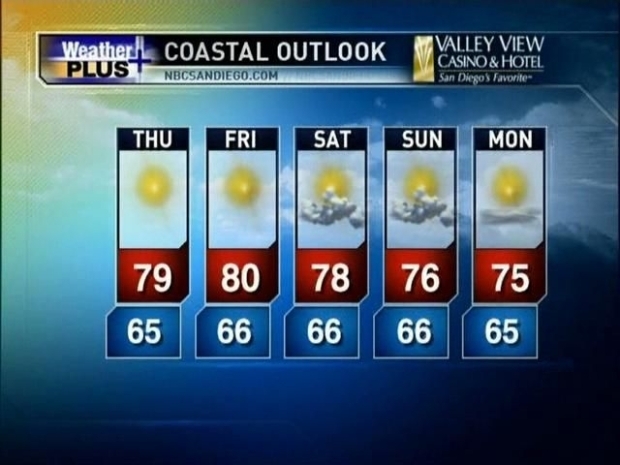 Whitney Southwick gives you the Morning Forecast for Wednesday, July 14, 2010.